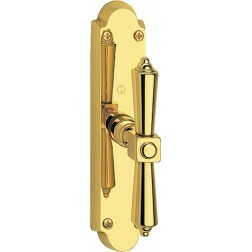 Hoppe cremonese window handle Singapore series. You need the mechanism to install it. Mechanisms available here. The hoppe cremonese window handle Singapore series is robust, thanks to solid brass construction. The size of the lower plate are 170 x 38 mm. While the handgrip is 117 mm long. The Singapore series is available in antique finishes of Antiqua line: gold, silver, bronze and antique burnished. Perfect with natural wood furniture like a rustic or nordic style.